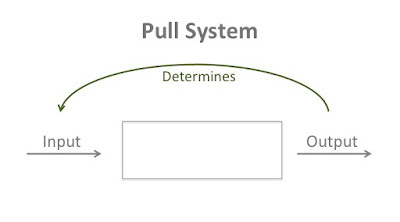 Lean und Kanban: Seriously, what is a Pull System? Seriously, what is a Pull System? Almost 5 years ago, I‘ve published a blog post called What the F*** is Pull? 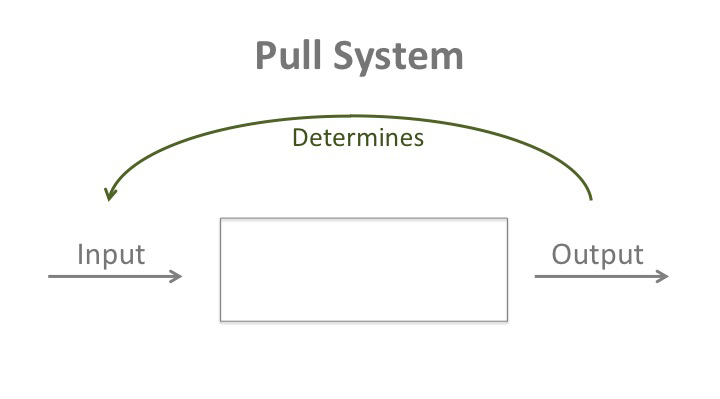 The distinction between Pull System and Pull Behavior, that we‘d come up with earlier at the Kanban Leadership Retreat still makes a lot of sense to me. Yet I keep seeing a lot of confusion around the concept of pull, and I myself often had troubles explaining it in a crisp, comprehensive way. A couple of months ago, I was fed-up, freed up some time and thought about it a little bit more. After a little bit of scribbling and googling, I wrote down a short definition, which I am quite happy with. And like with most things, I did not invent this definition, it had all been written down before. It‘s just that I did not read the right resources before and that the wording of many texts did not convince me. Often, the definitions are too detailed for my taste and too focused on manufacturing systems. 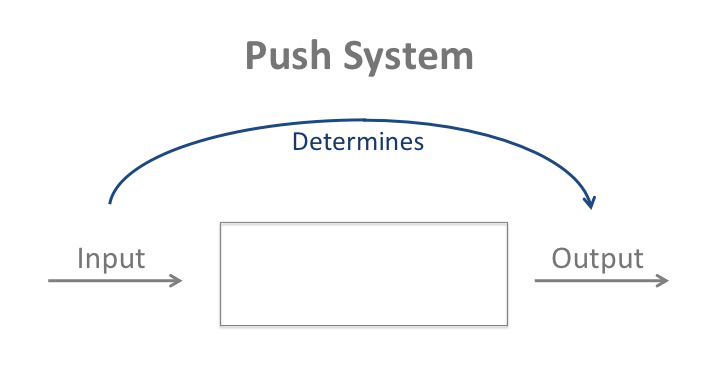 So here's how I define a Pull System as opposed to a Push System in a context of Kanban - maybe it‘s useful for others, as well. 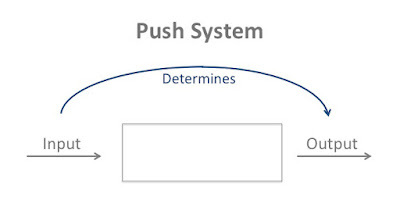 In a Push System, new input is determined by a plan or event. Output has to be adjusted accordingly. In a Pull System, new input is determined by the system‘s capacity/capability. Input has to be adjusted to the output. Now the connection between Pull and WIP limitation becomes evident. As Don puts it: "WIP limits are inherent to Pull Systems." If the input is to be determined by the system‘s capacity/capability, we 1) have to know this capacity/capability (therefore Lean‘s notion of studying the system and Understanding as one of Kanban‘s core values); and 2) we have to make sure that we never load the system beyond its capacity/capability. The easiest way of doing this is to only allow a new work item to enter the system, after another one has been finished. We have to "read" our system from right to left - just as we should "read" our Kanban board from right to left - hence the slogan Stop Starting, Start Finishing! It‘s worth mentioning that pure Pull Systems probably do not exist. As Don Reinertsen points out in his brilliant presentation The Science of WIP Constraints, even the leanest system has a push-pull-boundary, meaning that the pull mechanism only starts after a certain process step. Before this step, work is pushed into the system. Even at Toyota, there is a minimum of planning and buffering involved - they don‘t melt new steel for every new car.